This is the first Yes album that I ever heard, and although it took me several listenings to get into it (I actually hated it first time through) it completely won me over. 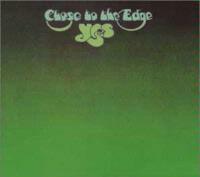 It is truly my favorite Yes album and the disc that got me interested in the band, and in progressive rock. They created a monster! The disc is composed of three epic length cuts, and they really got it right on this one. Everything gels extremely well, and there is no weak material. Truly the title cut at 18:50 is one of the most successful demonstrations of how an extremely extended rock number can remain cohesive and coherent. Many lesser bands have trouble with this, and I think Yes themselves sometimes do, too. This one starts slowly with the simulated sounds of birds and water gradually building and swirling courtesy of Rick Wakeman's keyboards. As this crescendos, the band comes in with a frantic and chaotic series of counterpoints dancing circles around one another. The result is somewhat hard to take at first, but really does feel a bit like a harder edged take on something from Fragile. As this carries forward, it is punctuated at a couple points by non-lyrical vocals. Eventually all this resolves down to a more melodic verse segment taking the song to its next movement. The cut runs quite a while working through and reinventing several musical and vocal themes. Eventually it drops to an atmospheric section and gradually begins a building process from there. This segment is highlighted by sort of a vocal duel between Anderson and Squire. The lines the two sing don't seem really related to one another, but almost as if both are singing two different, but complimentary songs. As this movement peaks, Wakeman takes over once more. He switches to synthesizer to re-energize the cut and move it to the next fast paced segment. This section moves and evolves, eventually returning to a chorus of "I Get Up/I Get Down" which is a reprise from earlier points in the composition. That chorus moves the piece to the dramatic resolution followed by Wakeman's keys in similar tones to the intro serving as bookends to the epic. This one begins tentatively with Howe on Acoustic guitar. As the piece begins to take on a bit of melody, it rather quickly turns a corner as the rest of the band begins to join the maestro. This takes the form of a rather folky sort of acoustic guitar laden ballad, but the arrangement adds a fairly quirky progressive rock element. Eventually it moves out to a new melody, driven heavily by Chris Squire's bass. This is short lived, though, then a brief chord moves it to a slow moving, but highly expansive segment that feels very joyous and spiritual. After a time this moves to a crescendo, then How takes over on the acoustic guitar again, eventually heralding another folky segment. Eventually this moves to another groove oriented section that moves quite well. This is probably one of the most organic prog rock tunes of all time, each segment feeling like it flows naturally from the one before. It is a very powerful and uplifting number. It ends with a brief and airy chorus based on acoustic guitar, vocals and gentle keys. In contrast to the fairly gentle textures of "And You And I", Steve Howe screams out the intro to this one, foreshadowing it as a frantic and hard rocking Yes jam. There aren't a lot of wholesale changes here, but each member of the band works towards smaller change ups, adding a vitality and freshness as the cut moves on. This has always been a personal favorite of mine, and Howe contributes some of his most frantic and high energy guitar work of any Yes song.